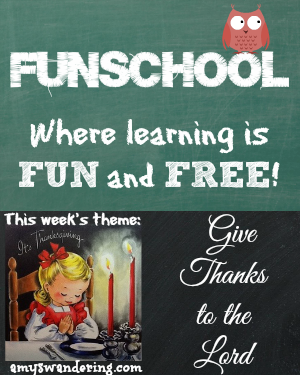 Welcome to Funschool, a weekly list of FREE educational lesson plans and printables built around a seasonal theme. This week’s theme is Thankfulness – Give Thanks to the Lord! Thanks for featuring my printables! We are using them in family devotions and really enjoying the time spent focused on being thankful for what God has given us. This list is great. Thanks for sharing.